23 April - 1 October. 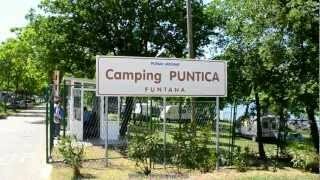 Puntica is a small, unassuming and old-fashioned campsite. Everything is modest here and if small is your thing, you will love it. There are 240 pitches of which 130 are for touring units. Some of the flat, variably sized pitches (80-120 sq.m) are shaded amongst trees which could test larger units. The waterside pitches are lovely but many of these are occupied by permanent units. Electricity box positioning may warrant long leads in some areas (up to 10A). The marina alongside is very active, and there are views from the terraces of the rustic restaurant and bar. There is a paved area around the tip of the site for sunbathing and ladders give access to deeper water. This is part of the Plava Laguna Group of sites and the facilities at one of the group’s other sites close by are available to guests here. The shop is simple but will provide for most of your needs. So if you want to get away from it all in a delightful location with cheerful people try this site. The night views are fabulous and the village of Funtana is typically Croatian and relatively unspoilt. There is a lot of choice by way of eateries. Sightseeing trips of Istria can be organised. One main sanitary block and other smaller blocks are kept clean and provide good facilities. British and Turkish style toilets with one unit for disabled visitors. Washing machines and dryers operated by the ‘laundry lady’. Small shop. Restaurant and bar. Motorhome services. Fishing. Playground. Gas barbecues permitted. Fridge box hire. Site is on the main road between Porec and Vrsar, near the village of Funtana, 7 km. south of Porec. Just watch for the camping signs.